Near the fishing ponds in Kampung Katulampa (Bogor, West Java, Indonesia), there’s a small rice field. The rice plant has just been harvested. 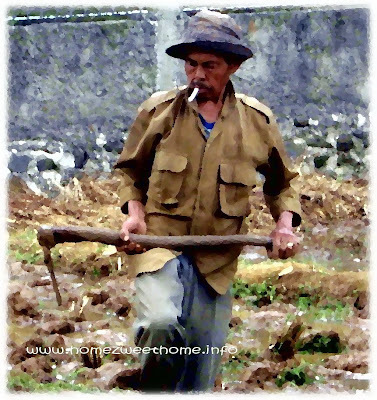 With his mattock, this man processed the soil to be planted again. I added the oil paint effect to this photo. Enjoy. a toast to this hardworking man! nice nice.. are you a professional artist? i just love the pictures and other talents you have. very nice shot Lina...I like it! Love what you did to the photo, Lina.